First published in 1996. Three major and topical issues which affect the lives of people with learning difficulties and those who work and live with them are sexuality, integration and age appropriateness. These issues are contentious and controversial and there are no simple solutions. 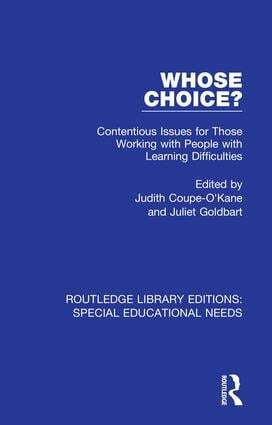 In this book, preconceived, established and sometimes narrow views of what constitutes integration, sexuality and age appropriateness are challenged and a discussion of thought-provoking alternatives are explored from the perspective of the child or adult with learning difficulties.